It turns out the price action did not retrace at all and it hit my tp after 2 bars! Amazing! Interesting how my balance is now 5+ USD up from 1000 USD deposit, even though I felt like I took so many trades that ended up losers. Maybe it’s the trades that I took which I cut straight away before hitting my SL, I will check this on my end of week retrospective. Wavetrend alert triggered an oversold crossover yesterday so I went long on USDCHF. As of now (the following day) the price action has been ranging below my entry, so I have been negative. 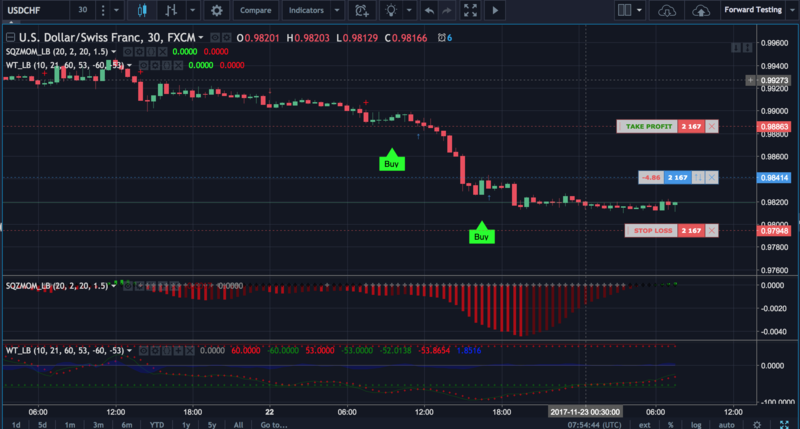 My mistake here is that although the wavetrend is oversold, I didnt pay attention to the squeeze momentum, which was at the time of the entry, still showing signs of a strong bearish trend. Since I can see the squeeze momentum reversing, I will wait and see how this trade plays out. I paid the price of this mistake. This trade has been open for two whole days, hovered below my entry price and finally hit my stop loss this afternoon. My squeeze alert triggered at 08:30 and before I entered the price action is firmly holding on the 0.786 fib line, maybe I will short not now, but set a sell stop order just below the fib line to confirm the downtrend. Interesting result, my stop order got hit, and my prediction was half right as the price action went my way, tested the next fib level 0.618 but started reversing, this time I sized my take profit to go 1:1 against my SL which I think in hindsight, I should have placed the TP on the fib line. The reason I didn’t was because I thought the level is too tight, and it wouldn’t have been a 1:1 risk reward for me. Although this trade looked originally good, the entry setup was good, and the price hovered just below the entry level (its a short, so this is positive equity for me), 2 days later the price spiked up and hit my stop loss. I love pending orders. They are virtually the only kind of order I use any more. They allow you to play an if/then confirmation game with your trades. If I am right, and price is going to do XYZ, then price will move through this zone, triggering my order. Being wrong (ie, price does not punch through the resistance level but instead bounces off of it) typically costs you nothing. It’s fantastic risk management. Definitely going to start using them more often after the result that I got! 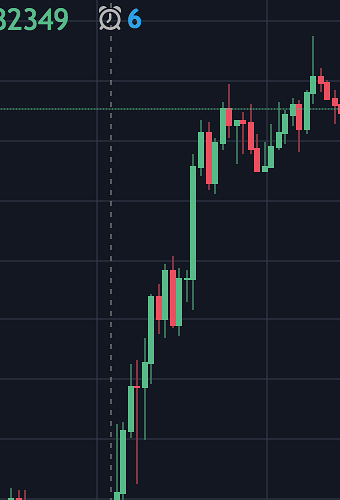 I think one psychological hurdle I need to get over it is getting panicked when an alert triggers, thinking I should get into the action as soon as possible or I will miss the price. Remember that profit is a function of price movement and position size. With correct position sizing you don’t actually need a large price movement to produce decent profits. In fact, the closer your profit target, the more likely you are to actually score a win. As I develop more confidence in my system I have been pulling in my profit targets (and my stops, to maintain my R:R) to trade progressively smaller movements. Positions that I used to sit in all day are now typically finished within a few hours. Squeeze alert triggered here, the following bar seems to heading down, so I decided to drew a fib and look for my long entry point. So the trend left without me! Damn it!!! Cancelling this limit order and reviewing my psychology on this, it’s a fairly new concept to me, and I reckon it will be more frustrating when I’m trading for real. Hahahahaha. A moral victory, at least. The point is, you had a coherent vision of what the price would do, and the price went and did (almost) exactly that. Well done. Just remember, in future, that trying to call the exact top or exact bottom can leave you with nothing. Don’t let ‘perfect’ become the enemy of ‘good enough’. Edit: Also remember that this cost you nothing. That’s the best kind of ‘mistake’ to make. At around 5PM an alert triggered for USDJPY while I was in the office so I decided to take this trade with my usual plan: Draw fib, decide on SL and size position, all that jazz. I went for work drinks, came back home and noticed my position has increased slightly. I won the trade! However I lost the screen of my SL and TP levels because I was in such a hurry to get out to the pub and grab a pint. and for some reason, TradingView’s paper trading doesn’t actually keep track of the orders, or they clear it. Luckily they have a journal that although doesn’t show everything, it definitely gives me a history of the win. I’ve decided to write some sort of weekly summary to discuss aspects of my trading I want to highlight and improve, as well as performance and prep on the following week. So looking at my posts from last week. I started a fake balance of 1000 USD and I came out slightly positive +5 USD but this is because two of my losing trades I cut early because I understood my issue, instead of letting the trade hit the stop loss. For this I am using a combination of the economic calendar on BP and the analysis post from Pip Diddy. Observing the major FX pairs, I noticed that USD had a really massive impact on Wednesday 22nd 13:00 UTC. There were three US reports at this time and the only report that stood out to me was the Durable Good Order which was reported worse than expected and this the dollar really took a hit. The sentiment seemed to be positive for the greenback a couple of hours before the report came out, and it caused a bullish trend until the evening. What is this “Durable Good Order”? why did it have such a big impact? Be stricter with conditions. If I am using a combination of Squeeze Momentum and Wavetrend Oscillator, only enter when they are both pointing to the same direction. DO NOT ENTER if they are pointing different directions. This happened on the three losses I incurred, so if only I had cut these, I would’ve not entered these trades. For squeeze momentum, setup alerts for momentum loss. Activate when you have an open trade. Place limit orders instead of market order to find the perfect entry point and validate strategy. Risk / reward ratio does not have to be 1:1, place on levels instead. Recapped on STOP orders and LIMIT orders. STOP orders are for trend continuation orders, LIMIT orders are for trend reversal orders. Jitters on entry. I am so excited when an alert triggers, I feel like I need to move fast and place a market order straight away. I am aware that my brain is doing this, I plan to just slow down for now and place a pending order instead to control emotions here. I also want to assess my trading diligence. Trading takes so much of my time! (Duh!) It’s crazy, between gym, salsa, drinking, full time work and a relationship (as well as other ventures), journalling twelve trades felt like so much! I like the format but perhaps a good solution would be to make the journal entries into smaller versions. My current idea is a screenshot of the chart, order placement screen, and a short description of why we are entering this trade. Update with result as well as any notes for restrospective later. Adjust alerts for only when the indicators are pointing one way, and the other isn’t pointing another way. Draw sr lines, fib lines and use ADR to determine entry, exits, stop losses. NEVER place market orders. Watch out for EUR from Wednesday onwards, according to the economic calendar, there are multiple economic data reports coming out that are high impact until Friday. I’m venting on this blog to my own mistake… You cannot make a trading bot on TradingView! As I got quite skilled on writing indicators and strategies on Pinescript, I decided it’s time for me start automating some of my processes using some kind of bot. So I looked at TradingView. pinescript has “entry” and “exit” functions. Sure let’s use that. Wrote a simple exit strategy, implement a simple scaling out strategy to my trades. It turns out, strategy is using broker emulation! 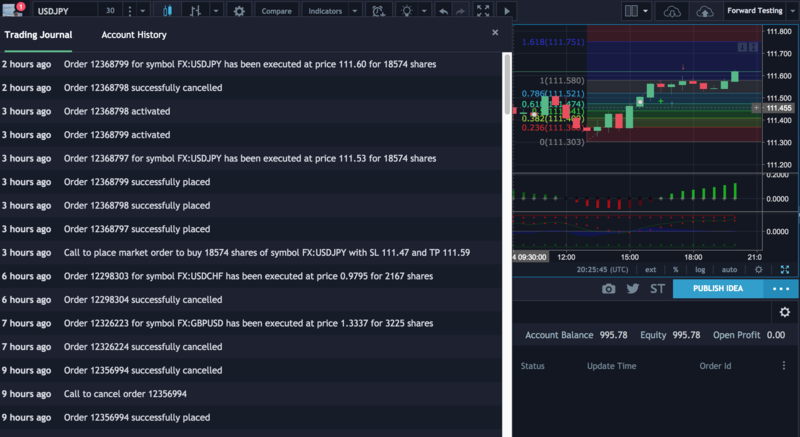 All trades are fictional and even if you connect to other brokers using a live account, the pinescript does not get affected. So now I’m changing my strategy slightly to instead connect to the brokers directly via their APIs, and automate the bot through there. Well see how that goes. 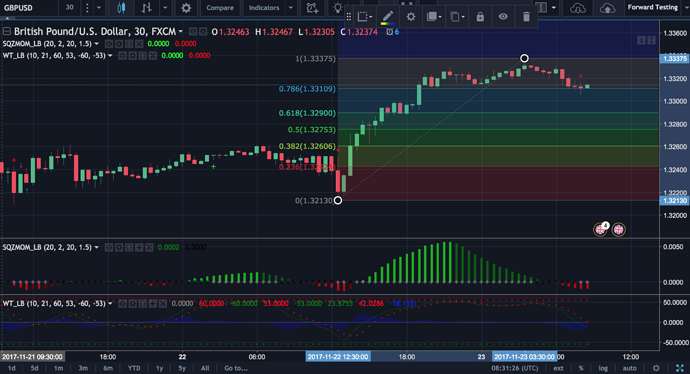 Squeeze momentum showing buy momentum, wave oscillator not overbought, so I drew a fib line and placed a limit order with tp and sl on the nearest levels. EDIT: missed my LIMIT entry, and trend left without me, nice. Nothing won nothing lost I guess.